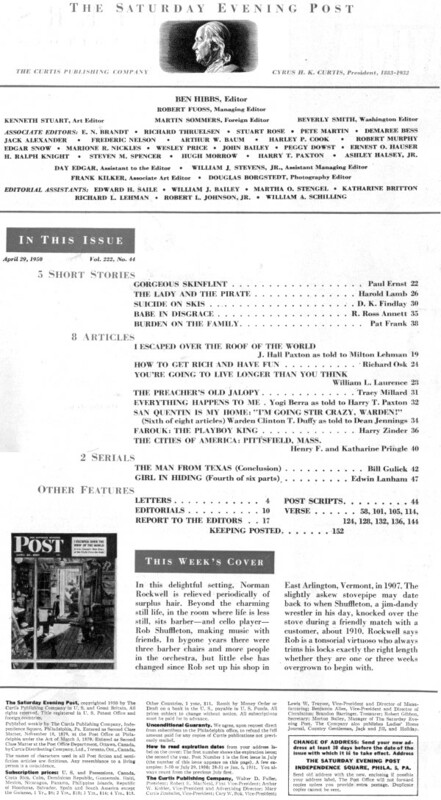 The Saturday Evening Post was a weekly publication from 1897 through 1961, and quarterly thereafter. 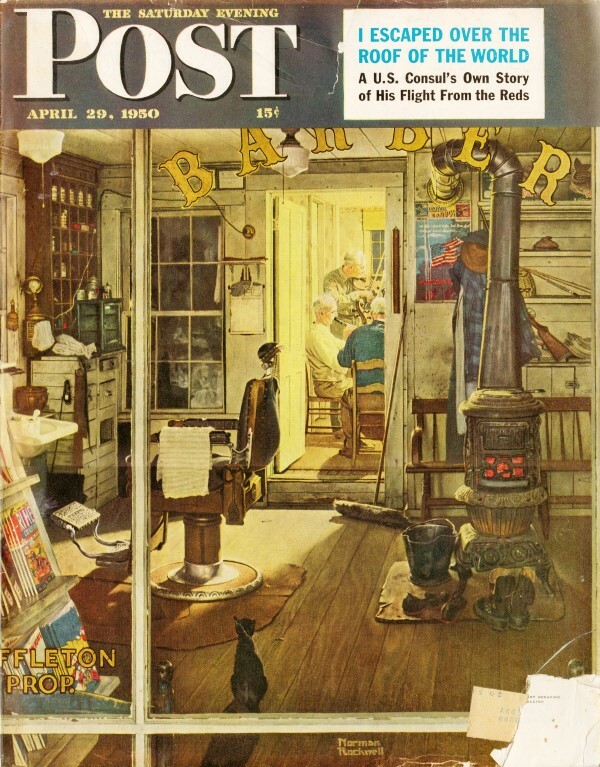 Norman Rockwell paintings famously adorned many of its covers, and Peanuts creator Charles Schulz published his first "Li'l Folks" comics in it. There are usually some nice articles and ads in them that appeal to RF Cafe visitors. It's not often that you will see a full-page ad promoting a particular element in the periodic table, but in 1950 that wasn't the case. 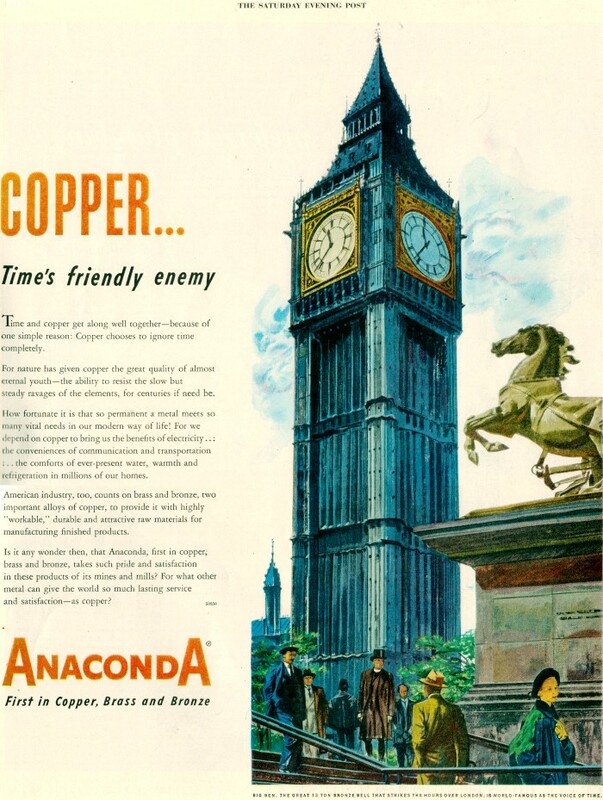 This advertisement for Anaconda Copper Mining Company promoted the virtues of element number 29 - copper (Cu , from the Latin "cuprum"). Aluminum and iron were other popular topics of advertising. If you do a search on the history of Anaconda, which is today owned by the Atlantic Richfield Company (ARCO), what dominates is the harm done to workers and to the environment. The short video below is one of the less vicious reports on the company's operations in Butte, Montana and in Chile. Time and copper get along well together - because of one simple reason: Copper chooses to ignore time completely. For nature has given copper the great quality of almost eternal youth - the ability to resist the slow but steady ravages of the elements, for centuries if need be. How fortunate it is that so permanent a metal meets so many vital needs in our modern way of life! For we depend on copper to bring us the benefits of electricity... the conveniences of communication and transportation ... the comforts of ever-present water, warmth and refrigeration in millions of our homes. American industry, too, counts on brass and bronze, two important alloys of copper, to provide it with highly "workable," durable and attractive raw materials for manufacturing finished products. Is it any wonder then, that Anaconda, first in copper; brass and bronze, takes such pride and satisfaction in these products of its mines and mills? For what other metal can give the world so much lasting service and satisfaction - as copper? As with many forms of mining back in the day, miners were subject to very hazardous conditions, lived in company towns in company houses, sent their kids to company schools, and bought their groceries at company stores. It was a rough life, and we who enjoy the abundant freedoms and conveniences availed to us today owe a huge debt of gratitude to them. Their contributions helped build a strong and prosperous America. Over time, conditions improved to the point where U.S. companies could no long afford to comply with all the burdensome regulations and also earn enough of a profit to stay in business here. The good news was they are finally completely safeguarded from the hazards of mining. The bad news is now workers in other countries who today exist under conditions similar to our early miners' conditions now do the hard, dangerous work while our people greet shoppers at Walmart, where products built in yet other countries by workers being similarly exploited (according to modern definitions) using those raw materials, produce the inexpensive items that appear on the store's shelves. We in advanced society are OK with the exploitation of human beings so far away that they never enter our conscience. Witness the Occupy Wall Street crowd living in and using high tech camping gear, keeping in touch on their iPhones and WiFi-connected notebook computers, wearing clothing manufactured in sweatshops, and eating food at least in part prepared using imported ingredients, served in styrofoam containers, and arriving and departing in vehicles spewing tons of evil greenhouse gases. Everyone to some degree does the same thing, but not everyone is as hypocritical as OWS types. What is my point? Just this: Sure, some jobs require a degree of risk, but many - if not most - people, regardless of where they live, are willing to trade off risk for opportunity. That includes Americans who would prefer an honest day's pay over a government check and food stamps. If our overbearing government, filled to overflowing with obnoxious, do-good busybodies, would ease some of the crippling regulations that have forced productive industries out of the country, the economy could quickly turn around. They believe themselves to be smarter than everybody else and that they have an obligation to babysit the stupid masses; i.e., common citizens. No, I do not advocate reinstituting processes that massively pollute lakes and rivers, air, and soil; however, science has come a long way since the turn of the last century that would allow an equitable and reasonable tradeoff of productivity and ecological damage. Research into new and improved methods to both increase productivity and reduce waste would continue at the same time. A strong American economy will "bring good things to life" worldwide. Unless we all return to wearing animal skins and foraging for berries, there will always be some harm done to the ecosystem just by virtue of our existence.